This biography of Chinua Achebe, author of the most widely read book in modern African literature, Things Fall Apart was among the various text layout/formatting and index projects done for the sister companies, Africa World Press and The Red Sea Press, Trenton New Jersey. The books of the projects are all available for order on the companies’ website- http://www.africaworldpressbooks.com/servlet/StoreFront and all major online retail stores including amazon.com and Barnes and Noble. Born in Ogidi, southeastern Nigeria, on November 16, 1930, Chinua Achebe has become one of the world’s leading fiction writers. He is a fascinating writer, whose life is of the stuff that makes fiction. Growing up in the cultural crossroads of colonial Nigeria, he lived and mediated in a world in which his people moved between allegiance to traditional Igbo beliefs and values and those introduced by the British colonialism, particularly Anglican Christianity under the Church Missionary Society. Achebe’s father was a zealous Anglican missionary, who was nicknamed Nineteen-Four, referring to the start of his missionary journeys in Nigeria in 1904. On the other hand, Achebe’s uncle, Udo Osinyi, was a die-hard Igbo, who stuck to traditional religion. It is said that he once ordered missionaries singing choir songs in his yard to leave, stating “Your singing is too sad to come from a man’s house. My neighbors might think it was my funeral dirge." This tension-filled life at societal crossroads would inspire such Achebe classics as "Things Fall Apart," which dramatizes the disintegration of traditional society with the coming of the white man and the unsuccessful mobilization of “native” resistance. 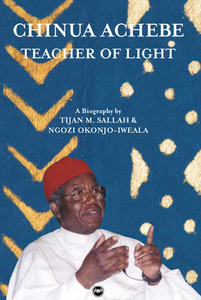 Written in simple, straightforward Achebe-style English, this book is about Chinua Achebe’s life story, starting from his formative years with his family in Ogidi to his development as a writer at the pioneer institution, University College Ibadan, his role in the Nigeria Civil War with the Biafran cause and his witness of horrific tragedy, his eventual immersion into literary and political controversy, and finally to his enduring spirit and challenging vision of great hope for Nigeria and Africa. NGOZI OKONJO-IWEALA joined the World Bank in February 1982 and is presently the director of Operations, Middle East and North Africa Region. She has published several papers in development journals, most recently “The Impact of the East Asian Financial Crisis on Laos and Cambodia,” which she co-authored with Bank colleagues. She is currently co-editing a book titled "The Debt Trap in Nigeria."